WATCHFUL: Collector Gaurav Uppal during the visit to district government hospital at Nalgonda on Tuesday. 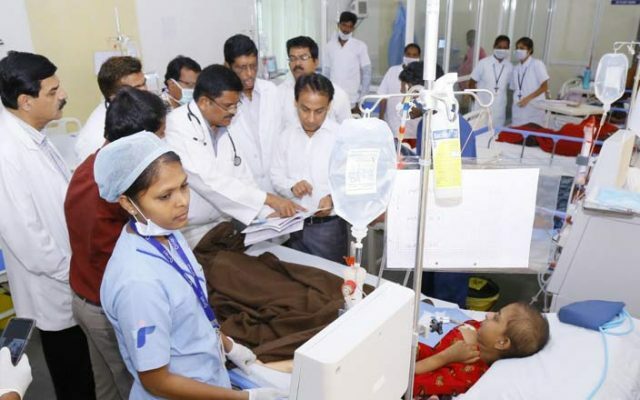 Nalgonda: The District Collector conducted a surprise visit to the government hospital at Nalgonda and inspected the casualty ward, Intensive Care Unit (ICU), dialysis centre, Mother and Child Hospital (MCH) and out-patient block. He also inquired with the people about the facilities and medical services being provided in the hospital. He checked the attendance register of doctors and inquired with the Superintendent of the hospital about the doctors who have been absent from duties for a long time. He has also ordered for removal of two contract doctors, Dr Sindhu Sree and Dr Aruna Kumari, for remaining absent from their duties for a long time. He also instructed that the Assistant Professor Dr Sridhar Reddy be surrendered to Vidhya Vidhana Parishad (VVP) for not attending duties at the hospital. He has also ordered for removal of Counselor of Blood Bank Jacob, who was found absent from the duty during the surprise visit. Speaking to the media on the occasion, the district Collector has informed that night shelter would be setup on the premises of District Government hospital worth Rs 40 lakhs for the convenience of the attendants of the patients. In addition to this, toilets complex would also be constructed in the hospital. Stating that the State government was keen on improve the health care facilities in the district, he told that Medical College would also going to become operational from the next academic year. The Medical Council of India (MCI) has already inspected the facilities being developing for medical college one and second time inspection would be soon for permissions to conduct admissions into the college. He reminded that Assistant Professors have been recruited for medical college, hence no question of shortage of doctors in the government hospital.